Today I am posting the recipe for Tutti frutti cake. 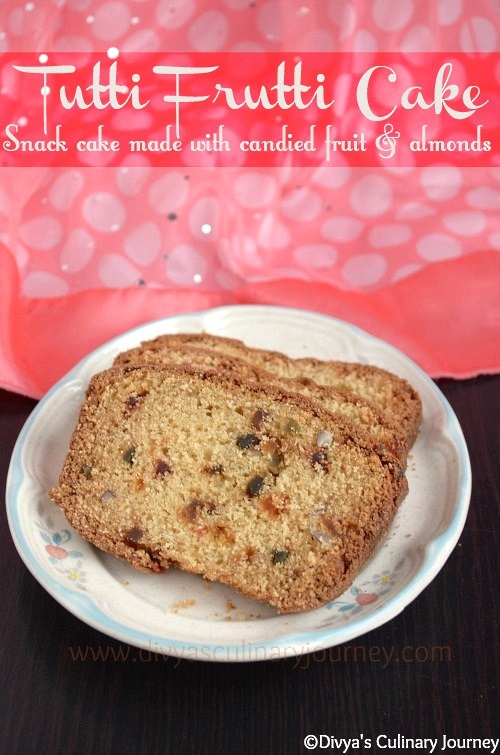 It is a snack cake made with tutti frutti (candied fruits) and almonds. I am a great fan of tutti frutti and like adding it to everything when I get a chance. 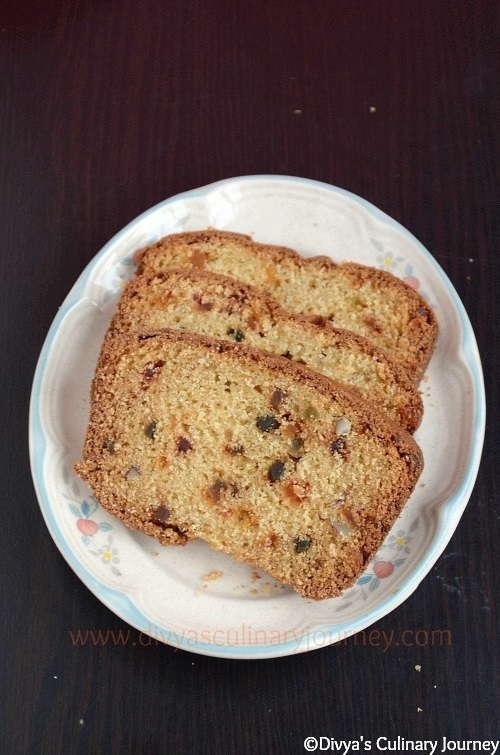 This cake can be Fruits and nuts cake when you can replace or add other dried fruits like dates, dried cranberries, raisins etc., and nuts of your choice too. 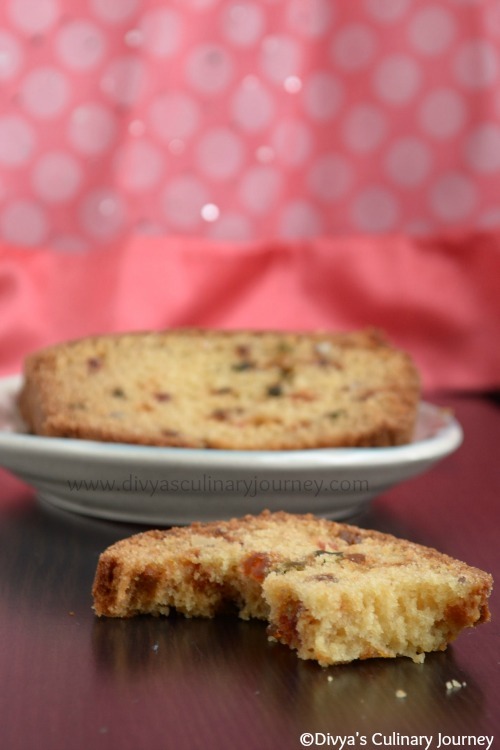 This cake is similar to tea cakes served in the bakeries and also this tutti frutti cake is perfect to be served as snack with tea. What are the ingredients required? Preheat the oven to 350 F. Prepare the loaf pan by greasing and flouring it. In a bowl, combine together all purpose flour, baking powder, baking soda, salt and keep it aside. In another bowl beat butter and sugar together until it is fluffy and then add eggs one by one and beat well. To this add vanilla extract and almond extract and mix well. To this mixture add flour mixture and milk alternatively and keep mixing till they are well blended. Finally add tutti frutti and chopped almonds and gently mix till they are fully incorporated. Now pour the batter into the prepared cake pan and bake for about 45-50 minutes or until the cake is done. Remove the cake from the oven and let it cool completely. Slice the cake and serve. You can add or replace any other dry fruits or nuts of your choice too. As per the original recipe, instead of vanilla extract pineapple extract is used. Then the cake will be pineapple tutti frutti cake. Baking time varies with each oven. So check yours accordingly. Let the cake cool completely, then slice the cake, to get perfect slices of cake. 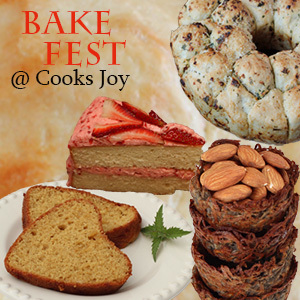 Linking this to Sangee's Love 2 Bake & Vardhini's bake fest happening here. Super tasty tuitti fuitti cake. Made to perfection. The last click is tooo tempting! !! Delicious! !! Cake looks yum da I love the addition of almonds, I am not sure why the colour of tutti fruitti is dull. I faced a similar situation in one of my cakes. wow..cake looks so yummy and delicious...really it looks like our bakery style snack cake...will give it a shot soon! 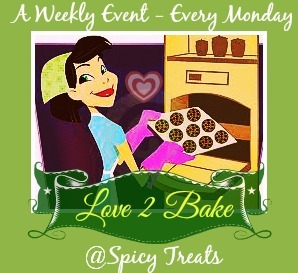 Thanks Divya for sending it to Love2bake event! Fantastic tutti frutti cake Divya. You made it just like store bought. Yummmmmmmy! wow super moist and fantastic cake dear :) wonderful clicks !! Delicious cakes, perfect with a cup of tea.. I love tutti frutti too, made this one but eggless, will post it too. Wow !! Super tasty cake dear !!! super soft and moist cake..very cool..
Hi Ram again, how much does one cup measure to? (pls mention in gram or in ml while measuring water). One cup is equal to 236.5 ml to be precise. one more small, query is maida and all purpose flour same, can we use maida instead of all purpose flour? Please bare with the question, as i am new to baking. Hello Ram, No Problem, you can come back with any query related to recipes I have posted here and I am happy to help. Yes. You can use Maida for All Purpose flour. Do try this and let me know how it came out. Also do we need to use powdered sugar or normal sugar?